Waterlink/Hycorcled boxboard mill uses recycled paper, newsprint and recycled corrugated product to produce furnish. This material also contains substantial amounts of plastic, wraps, plastic envelope windows, glued edges and staples. The mill discharges approximately 600,000 gallons of water through the sewer system and landfills its waste solids. Although the effluent was screened through an old mesh screen, many of the rejects escaped into the effluent, and those that were captured were wet and sloppy. The plastics that escaped floated into the municipal sewer system and created problems there. 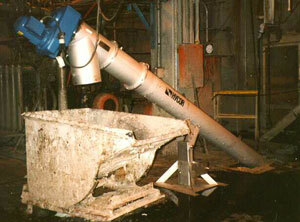 To solve the problem, the mill installed a Hycor Helisieve system. This in-channel screen fit directly into an existing channel with minor modifications. The Helisieve system handles screening, conveying and rejects dewatering in one convenient system. Once it screened the rejects, it moved it up the conveying spiral to the Helisieve's dewatering zone. After dewatering, the rejects dropped into a dumpster. The city noticed the reduced plastics discharge the same day the Helisieve system became operational. And the dewatered rejects were dry and acceptable for landfill. , 29850 North Skokie Highway, Lake Bluff, IL 60044; Tel: 847-473-3700. Fax: 847-473-0477.